You are currently browsing the Collector Model blog archives for September, 2013. ALIEN made audiences cringe in 1978 and played a major roll in cementing science fiction as the next great film genre. Among the intricate set and spaceship design work, the costumes contributed greatly to the film. The environmental protection suit is the focus of this resin model kit of Executive Officer Kane. The resin parts capture every detail down to the quilted pattern of the suit. 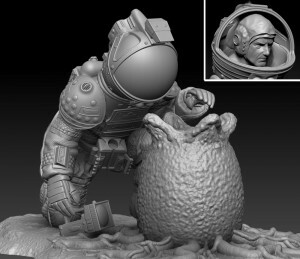 The kit focuses on the tension-filled moment where Kane first encountered the bizarre ALIEN life form in its embryonic egg. The kit is engineered to allow realistic lighting effects. Everything rests on a detailed base as well. Decals and illustrated instruction sheet are included to finish the model. 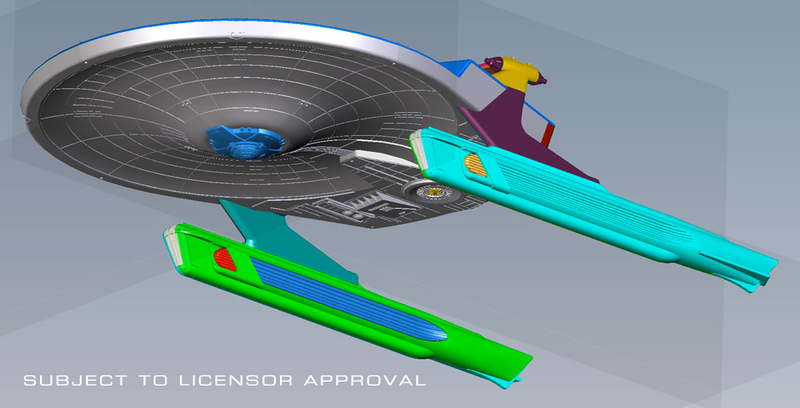 We had announced at Wonderfest that we’ll be releasing a 1:1000 scale kit of the U.S.S. Reliant in 2014. It is personally one of my favorite Star Trek ships. We’ve been working on it for a while now. Angelo Bastianelli who worked on our recent Cadet Series models built the CG model. At this stage, there are still a few details for the factory to nail down, and then we’ll be able to see a prototype (hopefully soon). The original “Star Trek” television series featured technology that had first appeared decades earlier in science fiction stories. Pulp heroes had been wielding ray guns, flying faster than light and teleporting from place to place since the 1930s. But perhaps the true inspiration of Star Trek’s superscience is the revolutionary physics discoveries of the early 20th century. Relativity, discovered by Albert Einstein and quantum physics, pioneered by Max Planck revealed a universe far different than ordinary human experience might suggest. Warp drive in Star Trek works by annihilating matter (in the form of deuterium, a kind of hydrogen gas) and antimatter in a fusion reaction mediated by dilithium crystals. This produces the enormous power required to warp space-time and drive the ship faster than light. In 1962 the world was introduced to the future as The Jetsons made their television debut. Set in 2062, the show followed the day-to-day exploits of family man, George Jetson. 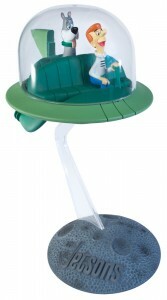 This re-issue of the Jetsons Spacecraft model kit is a simple to assemble snap-together model. It comes injected in green and clear plastic and includes prepainted figures of George and his loyal dog, Astro. Both figures have been re-sculpted to capture authentic likenesses of the characters.